In addition, it would require that employees accrue a minimum of 1 hour of paid sick time for every 30 hours worked up to a maximum of 24 hours for a calendar year. This analysis evaluates the potential impact of the higher minimum wage. The paid sick time should enhance the ability of lower wage workers to handle personal and family emergencies and medical issues without loss of employment and should have a fairly negligible impact on employers. Historical changes in the minimum wage and how $10 and $12 an hour compare to past minimum wages in today’s dollars. Portion of Arizona workers impacted if the minimum wage is increased. How costs to cover the minimum wage would be distributed. In short, Prop. 206 would increase the minimum wage to a level that was last seen in the late 1960s when controlling for inflation, so the change is within historical experience, though for only a short period of time. Using data from federally done employer surveys, this evaluation finds that approximately 803,000 Arizona workers would be directly or indirectly impacted by an increase of the minimum wage, 30 percent of those employed. Following the spirit of the Congressional Budget Office’s approach, the Grand Canyon Institute estimates a $12 minimum wage in 2020 will lead to approximately 13,000 fewer jobs with 790,000 workers receiving positive hourly wage gains. This study explores three possible employment outcomes with the middle one following the spirit of the Congressional Budget Office’s (CBO) approach when they evaluated a $10.10 minimum wage in 2014. Adjusting the CBO approach for a more significant increase in the minimum wage to $12 an hour, the Grand Canyon Institute estimates employment losses of approximately 13,000, meaning 790,000 receive positive hourly wage gains. Using higher end estimates in the economic literature would mean about 26,000 job losses and 777,000 receiving positive wage gains. Alternatively, a significant body of literature finds no significant job losses from minimum wage increases. The model used by the Institute for Research and Labor Employment at the University of California, Berkeley finds no job loss due to the added buying power provided from the higher local consumption rate of those workers benefitting compensating for jobs lost due to higher labor costs or price increases. As job losses to the degree they occur may manifest themselves as lower employment growth, for perspective, the state of Arizona currently adds approximately 15,000 jobs at all pay levels per quarter. The economic literature also suggests consumer price impacts due to the higher minimum wage overall would likely range from 0.5 percent and 1.6 percent, though fast food restaurants may increase prices by about 6 percent by 2020. Among those benefitting from income gains, nearly 90 percent of beneficiaries will be 20 years or older and two-thirds of beneficiaries will be at least 25 years old. Women will benefit a bit more than men and 40 percent of working single mothers are expected to benefit. A higher minimum wage will reduce inequality, but only have a modest impact on poverty. Half the gains will go to families with incomes up to $40,000 a year, twice the poverty rate for a family of three. Overall, higher wages are paid for primarily through higher prices and to a less extent improved efficiencies, and probably to some degree a reduction in profits. Rural areas would both benefit the most and bear the greatest costs. Wage levels in rural areas are lower, so consequently a greater portion of the workforce would receive higher wages. However, rural businesses and customers would bear that cost, so businesses may be placed in greater strain in rural areas as compared to urban areas. The Grand Canyon Institute does not take a formal position on this initiative. Adjusted for inflation, the minimum wage in 2020 would slightly exceed the buying value of the 1968 minimum wage. The Fair Labor Standards Act in 1938 established the first federal minimum wage at 25 cents an hour. The FLSA required Congressional authorization for the minimum wage to be increased, which has occurred 22 times under 12 Presidents, most recently President Obama in 2009. Until 2006 Arizona followed the federal minimum wage. 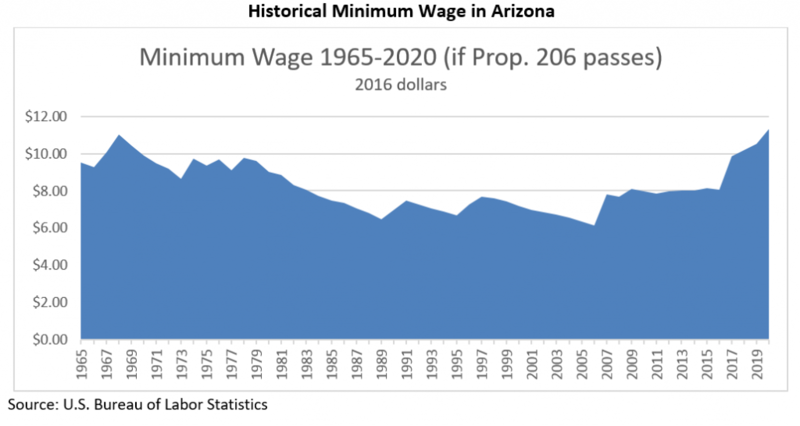 However, due to a ballot initiative passed in 2006, the Arizona minimum wage increased from the then federal level of $5.15 an hour to $6.75 an hour in 2007, and has been adjusted annually subsequently for changes in the consumer price index. The federal minimum also went up in 2007, 2008 and 2009, ultimately to $7.25 an hour. Today the Arizona minimum wage is $8.05 an hour. Figure 1 looks back historically at the buying power of the minimum from1965 until today as well as projects the real value of the minimum wage if Prop. 206 passes. The real minimum wage is shown in 2016 dollars, so one can see how much past minimum wages are worth today. In addition, assuming an inflation level of 1.5 percent per year, the buying power of future minimum wage levels are indicated, if Prop. 206 were to pass. Because 2020’s minimum wage of $12 an hour is expressed in 2016 dollars, not 2020 dollars, you’ll note that in 2016 dollars the value of the minimum wage is $11.31 an hour. Likewise, the $10 an hour minimum wage appears as $9.85 to reflect the 1.5 percent anticipated inflation between now and this time next year. Figure 1 illustrates that from 1967-1970, the federal minimum wage of $1.60 in today’s dollars would exceed the buying power of a $10 minimum in 2017. The $11.31 value of the minimum wage in 2020 would slightly exceed the $11.03 buying value of the 1968 minimum wage. Consequently, Prop. 206 would return the minimum wage to a level on par with the late 1960s. The Bureau of Labor Statistics reported based on employer surveys that as of May 2015 in Arizona, the 10th percent of the labor force earned $8.96 an hour, the 25th percentile earned $11.10 an hour, and the median worker earned $16.67 an hour. These figures provide the basis for estimating how Prop. 206 would impact the workforce. First, one needs to compare the Prop. 206 minimum wage with wage levels that would occur otherwise. With a growing economy with modest unemployment, wages are going up so we presume that by January 2017, wage levels will increase by 3 percent across the board from May 2015 levels. Likewise, each year moving forward, we assume that wage levels would continue to increase by 2 percent in the absence of Prop. 206. For simplicity, the size of the overall workforce is kept constant—so there are no changes either to the distribution of occupations. Though some economic research suggests that higher minimum wages tend to improve the labor force participation rate, which, all other things equal, would modestly increase the unemployment rate. Table 1 shows the May 2015 wage levels and anticipated wage levels from 2017 to 2020 in the absence of Prop. 206. By 2020 about 800,000 workers are directly or indirectly impacted by a $12 minimum wage, about 30 percent of those employed. Source: Bureau of Labor Statistics “Occupational Employment Statistics” for Arizona and annual adjustments computed by author. As can be seen in the highlighted areas of Table 1, Prop. 206 would impose minimum wages beyond what those at the 10th percentile are currently earning, and by 2020 would nearly reach the level of the 25th percentile. These are workers directly impacted by Prop. 206 and they are also illustrated in Figure 2, rising from an estimated 360,000 in 2017 to 610,000 in 2020. However, workers close to the new minimum wage would also be impacted. 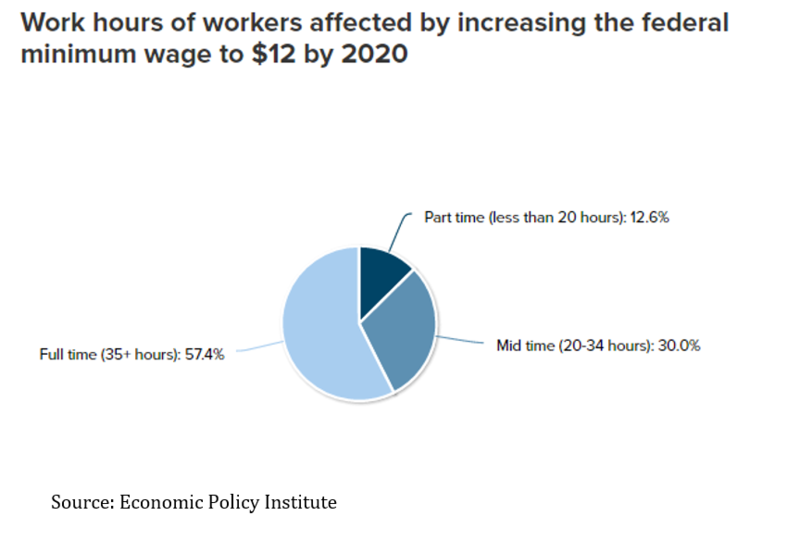 Economists typically expect additional wage boosts for those workers up to 15 percent above the minimum wage, so workers earning more than $10 an hour up to $11.50 in 2017, and workers earning more than $12 an hour up to $13.80 in 2020. These total about 280,000 workers in 2017 and 190,000 in 2020. These workers should also expect a modest pay increase, as employers try to preserve some level of a premium above the minimum wage to encourage better morale, productivity and lower turnover. So collectively in 2017 about 650,000 workers are directly or indirectly impacted and in 2020 that number rises to about 800,000 out of 2.6 million employed or about 30 percent of those employed. Population and those employed may continue to grow during this time period, making these numbers somewhat higher than in the chart. For instance, Arizona is currently adding approximately 60,000 jobs per year. If that pace were to continue, the figures estimated here for the number of workers directly and indirectly impacted would be approximately 50,000 higher in 2020. So as not to add additional variables and due to the unknown nature of economic growth in the next three years, the workforce is held constant in this analysis. Will Prop. 206 reduce employment? Within the economic literature there is dissension over the impact of higher minimum wages on employment with one segment of the research finding a ten percent rise in the minimum wage corresponding with approximately a 1.5 percent decline in teen employment. That body of research provides less depth with respect to overall impacts of employment but generally considers the impact to be less, as somewhat older workers tend to be more productive. Over the last 20 years another body of research has utilized establishment level data (e.g., restaurant payroll), especially in the restaurant sector, but recently a seminal paper has sought to expand that methodology to a national wide database. They find no employment loss due to higher minimum wages. Both approaches are utilized in the context of Prop. 206 to present alternative scenarios that may play out. In 2014 When President Obama proposed a $10.10 federal minimum wage, the nonpartisan Congressional Budget Office (CBO) estimated its impact after doing a thorough review of the literature. A movement from $7.25 to $10.10 an hour represented a 39 percent increase in the minimum wage, less in those states like Arizona that had higher minimum wages. The age demographic data in Table 2 comes from the Bureau of Labor Statistics for the United States, not just Arizona. Presuming the distribution by age group is approximately the same in Arizona then, applying the approach of CBO leads to an estimated loss of 13,000 jobs under Prop. 206 compared to a situation where it did not pass. However, 790,000 directly and indirectly impacted workers gain a higher hourly income. The CBO presumed for teen employment that each 10 percent increase in the minimum wage would reduce teen employment by 1 percent and reduce all other low wage worker employment by 0.33 percent among those impacted directly from the change. Due to the higher minimum wage proposed with Prop. 2016, for this analysis, we break workers into two groups. One that currently earns less than $10 an hour and another than earns $10 an hour but less than $12 an hour. We also introduce an additional middle age range of 20-24, so there are three age ranges. The CBO had inferred that greater increases in the minimum wage would make for a higher elasticity (rate of job loss for a given increase in the minimum wage) more likely. This would largely be due to the greater size of raises that those on the lowest end would be receiving and the larger number of workers impacted. Ultimately in real dollars those earning the $8.05 minimum wage will be receiving a 40 percent pay increase if the minimum wage becomes $12 and hour in 2020. Presumably some employers will reduce their workforce as a consequence and these lower wage workers are far more likely to be laid off than someone who is already earning $10 an hour. As by contrast that $10 an hour worker in real terms will be seeing a 15 percent pay increase as the minimum wage rises to $12 an hour in 2020. So for those whose wages go up the most, the elasticity of employment (or lost jobs) relative to the minimum wage rising we apply as -0.15 (a 10% rise in the minimum wage leads to a 1.5% fall in employment) for the lower wage group for teens, -0.1 for those 20-24, and -0.6 for those 25 and older. In the higher wage group, we apply similar elasticities as the CBO did in their $10.10 study: -0.1 for teens, -0.6 for those 20-24 and -0.3 for those 25 and older. The presumption is that older workers are more reliable with less turnover, so are consequently more likely to be retained. These results are summarized in Table 2. The 190,000 indirectly effected workers are presumed to also receive some kind of raise with no loss of employment, which is the approach used by the CBO in their analysis. Estimates are to the nearest worker. While following the CBO approach would likely most closely align with the thoughts of most labor economists, some economic studies find stronger employment losses. So the higher estimate presumes that elasticities found in those studies are applied—which are twice the elasticities used with the CBO approach. Consequently, the job losses double. The details are shown in Table 3. In these two scenarios the economic reasoning behind the decline in employment is two-fold. By raising the minimum wage, the cost of low wage labor increases leading employers to seek either capital or more skilled labor substitutes to the degree they are available and become more cost effective. Alternatively, hours of an establishment may diminish, if due to low customer traffic in off-peak hours, the higher minimum wage makes it less cost effective to stay open or they may work to better economize staffing. Second, raising the minimum wage increases costs leading to somewhat higher prices, which lessens consumer demand, leading to less need for workers. In addition, higher minimum wages in the entire economy has the potential to also boost consumer demand, which the third scenario emphasizes. 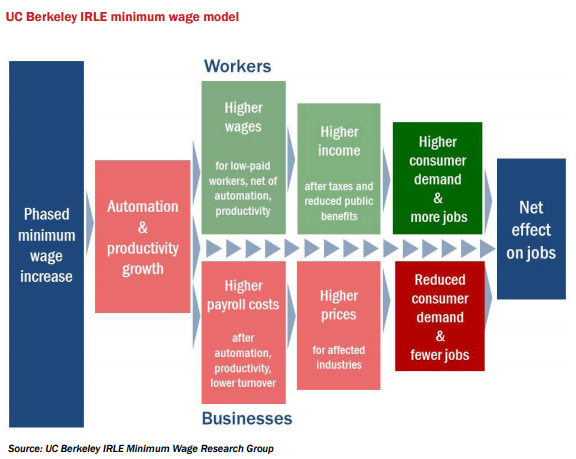 The Center on Wage and Employment Dynamics in the Institute for Research and Labor Employment (IRLE) at the University of California-Berkeley specializes in minimum wage research and is the leading proponent that minimum wage increases do not impact employment. Figure 3 illustrates the elements of their model. Though the diagram makes them appear sequential, in fact, they occur simultaneously. Higher minimum wages make capital equipment as a substitute relatively more enticing. Though economic research finds the impact for low-wage workers relatively modest, it still forms a basis for lost jobs. Higher minimum wages has also been found in several studies to reduce employee turnover, even in high turnover areas like restaurants. It also encourages firms to invest more in their workforce to improve productivity. Studies find that approximately 20 percent of the higher wage costs due to a rising minimum wage are captured through reduced turnover or operational savings. With enhanced productivity and less turnover, fewer workers are needed to complete the same task. In the context of their evaluation of New York’s movement to a $15 minimum wage in 2021, IRLE estimates losses in jobs from capital/labor substitution effects as well as productivity improvement leads to about a loss of 1.7 percent of directly impacted worker jobs. The IRLE New York study found the increase in the minimum wage from $9 to $15 an hour would increase operating costs across all industries by 0.7 percent. They estimate that each 1 percent rise in overall consumer prices leads to a 0.8 percent decrease in demand. Consequently, the modestly higher prices, lessening consumer demand leads to a further reduction of 1.5 percent of directly impacted worker jobs. Thus, total job losses amount to 3.2 percent of directly affected workers is in the middle of the estimates above. 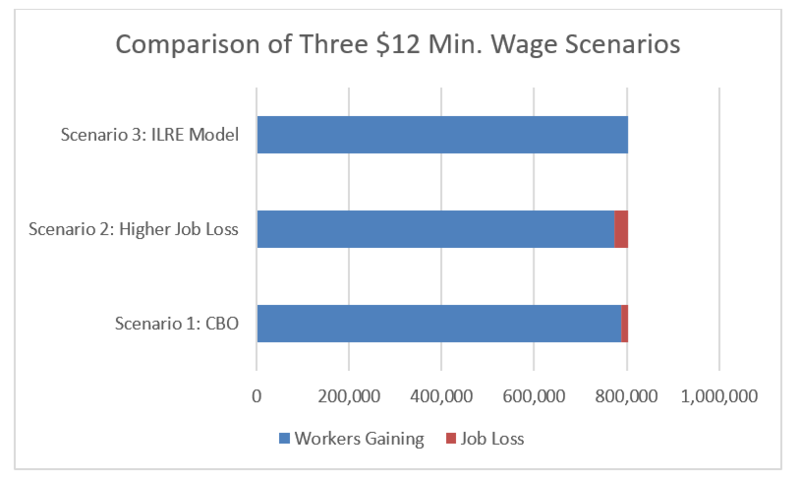 Scenario one with 13,000 job losses represents 2.2 percent of directly affected workers, while scenario two at 26,000 job losses is 4.3 percent of directly impacted workers. However, the IRLE model also takes into account increased local consumer spending, as the incomes of lower wage workers rises. Their propensity to spend is higher than the population at large—though this impact lessens as the minimum wage goes relatively higher. So in their New York state estimate, they find this added consumer demand leads to a 3.4 percent rise relative to the directly affected jobs. This higher demand translates into an added demand for workers to wipe out the downward effect. A similar IRLE study focused on San Jose and Santa Clara County also found the effects pretty much offset each other. Consequently, if such an analysis were done for Arizona, the effects should also approximately offset. Thus, there would be no net employment change due to a higher minimum wage. The three scenarios are compared in Figure 4 below. The city of Seattle is ahead of most other states and municipalities as they move toward a $15 an hour minimum wage. Consequently, whereas other work provides estimates, Seattle gives an opportunity to evaluate outcomes. While Washington state’s minimum wage is $9.32 an hour, Seattle is in the process of increasing its minimum wage to $15 an hour. Seattle passed their ordinance in June 2014. In April 2015 the minimum wage increased to $11 an hour for large employers (500+ employees) and employers using tips and medical benefits to reach $11 an hour. It rose to$10 an hour for other employers. In January 2016 it rose to $13 for large employers only. So presently minimum wages range from $10 to $11 (including tips and medical benefits) to $13 an hour. The minimum wage ordinance has not slowed Seattle’s dynamic growth and it continues to outpace the rest of the state. That growth, however, is not centered in the low wage sector. In their most recent study, they’ve found that Seattle workers who initially earned less than $11 an hour, now average $1.18 more per hour, of which they attribute $0.73 to the minimum wage ordinance. The rest they attribute to Seattle’s economic growth. The study team has found no evidence to date when comparing Seattle to “Synthetic Seattle” that the higher minimum wage has impacted the number of persistent jobs for lower wage workers. However, they have found a decrease in total hours worked at single location businesses where over 40 percent of those employed earn less than $15 an hour. Though a similar pattern is seen for “Synthetic Seattle,” making it difficult to assess causality. So at this point we still lack definitive data from Seattle, but positive impacts seem to largely outweigh any possible negative outcomes—though the decline in total hours (or hours per employee) is not yet clear as to its cause. Higher Prices from Prop. 206? For most business, the increase in the minimum wage will have only a very modest impact on their labor costs unless they are highly dependent on minimum wage or near-minimum wage labor. So if a highly minimum wage dependent business’ labor costs went up 20 percent and labor costs were 20 percent of their total costs, then total costs rise 4 percent. As already noted the IRLE New York State study estimated total costs for all businesses would go up 0.7 percent. Since Arizona is raising its minimum wage by $4 instead of $6, the impact in Arizona should be less, closer to 0.5 percent. A broader survey of studies of past minimum wage price effects using different methodologies suggests that any overall price increases in Arizona from increasing the minimum wage to $12 by 2020 would lead to additional consumer price increases of no higher than 1.6 percent, but possibly considerably less than that. Thus, a good plausible range for price increases due to Prop. 206 would be 0.5 to 1.6 percent. Source: Lemos (2008) and Reich et al (2016). Data in this section comes from an Economic Policy Institute (EPI) report for the entire United States, not just Arizona, of an increase in the minimum wage to $12. Additional data from this section comes from the American Community Survey of the Census Bureau, which is part of their efforts to create annual updates in between the censuses. Earlier data in the directly and indirectly impacted by age was also nationwide but used the Current Population Survey’s Annual Social and Economic Supplement (ASEC). 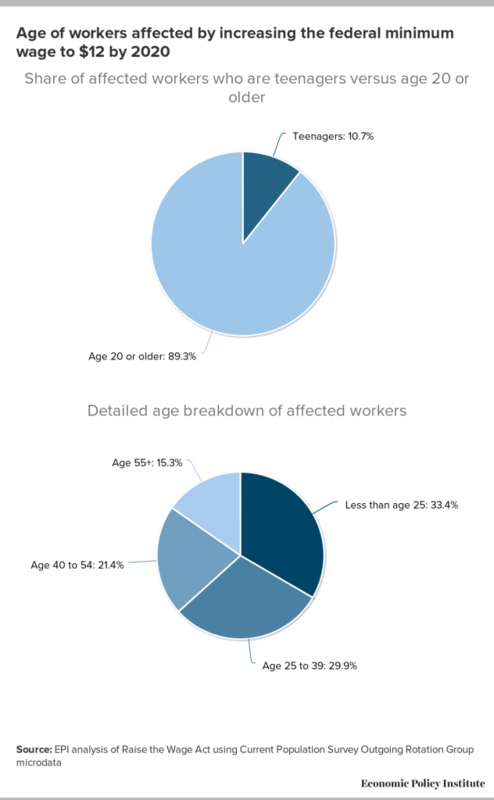 Figure 5 shows that teenagers compose 11 percent impacted both directly and indirectly and two-thirds of those impacted would be 25 years old or older. These results are largely consistent with the breakdown by age shown in Tables 2 and 3. Women earn less than men, so women would benefit more so than men as shown in Figure 6. EPI also estimates that 27 percent of working parents who are women would benefit and 14 percent of working parents who are men would benefit. In addition, 40 percent of single parents who are working women would benefit and 28 percent of single parents who are working men would benefit. Figure 7 shows the impact by hours of work. While a high number of those benefiting from a higher minimum wage work less than 34 hours per week, most are full-time. Finally in Figure 8 we look at the impact of the high minimum wage across families. The minimum wage is not a targeted poverty relief program like Food Stamps or the Earned Income Tax Credit. Consequently, its benefits while skewed toward the lower end of the income distribution do not go exclusively to low income households. 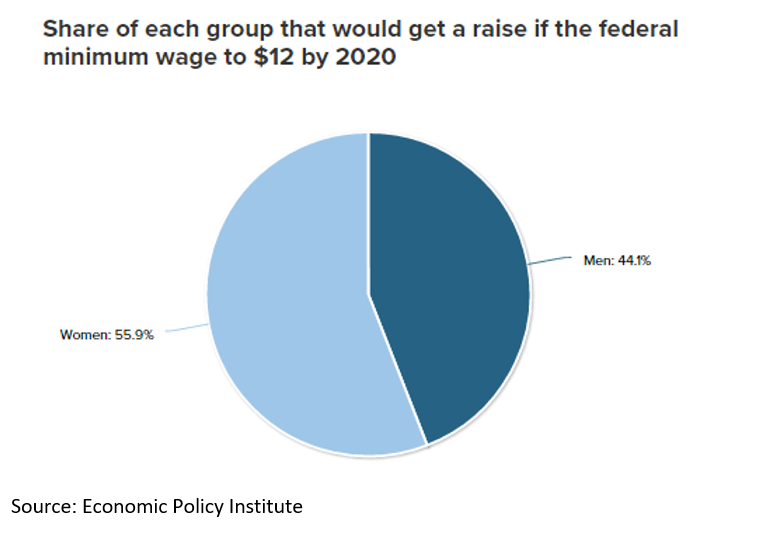 The results from the Economic Policy Institute for the $12 minimum wage roughly correspond with the findings of the Congressional Budget Office which only looked at a distribution for a $10.10 minimum wage. 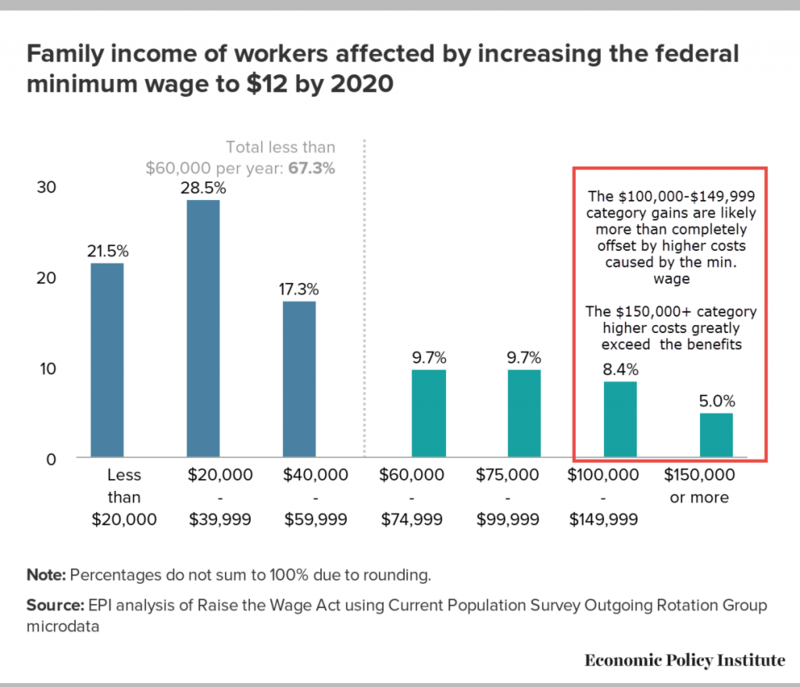 Figure 8 as presented by EPI did not include any of the costs associated with higher minimum wages, so in this presentation based on the CBO analysis, the income groups likely to see net costs exceed net benefits are noted in red. Economic studies generally indicate that much of the higher cost of labor is passed on to customers through higher prices, though reductions in turnover and other efficiencies also pay for part of the increased cost. Rigorous studies on profits aren’t available because even when businesses shared payroll information, they did not share profits. However, to the degree there are market constraints on raising prices and they added costs can’t be recaptured through efficiencies, then profits would decline, and that likely occurs in some businesses. Scenario three emphasizes the added customer spending that can result from higher minimum wages—which would help counteract cost strains. Rural areas have a far larger portion of their work force earning low wages, so rural areas would stand to benefit from a higher minimum wage more than urban areas. For the same reason, rural areas may be the most negatively impacted, if the business budget strains are more difficult to overcome. The CBO study found the benefits of a higher minimum wage (higher wages) exceeded the costs (any job losses or reduced hours and higher consumer prices and for some probably lower profits) for all income groups under 6 times the poverty line. For a family of three the poverty line is about $20,000. For a household size of two, the poverty line is about $16,000, so essentially collectively households below $100,000 in household income have a net benefit from the higher minimum wage, and somewhere around or above $100,000 it changes to a net cost. See Figure 8. If passed by voters, Prop. 206 would directly or indirectly impact about 30 percent of those employed by 2020. Almost all would see an increase in their take home pay as a consequence. Economists dispute whether any jobs would be lost. A method following from the Congressional Budget Office suggests 13,000 jobs lost. The high end job loss estimate would be 26,000. The model developed by labor economists at the University of California-Berkeley emphasizing the added impact on consumer demand from higher wages finds no net job loss. 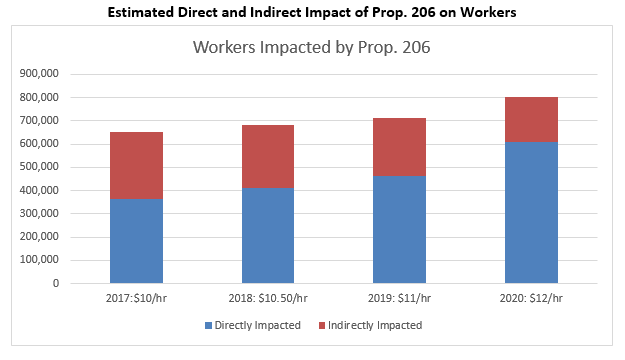 The number of directly and indirectly impacted workers earning higher wages would range from 777,000 on the low end to 803,000 (all of them) on the high end. Job losses, to the degree they occur, may be gradual and simply appear as slower growth over time. To put in context, Arizona currently gains about 15,000 jobs overall per quarter. Higher prices are one of the main ways higher minimum wages are paid for. Prices would increase modestly between 0.5 and 1.6 percent, though fast food chains would likely raise prices by 6 percent through 2002. Other means of absorbing the higher costs include internal firm efficiencies and for some businesses lower profits. Those benefitting would predominantly be over 20 years old (nearly 90 percent) and over 24 years old (two-thirds). Women would benefit more than men and about 40 percent of employed single mothers would see an increase in their earnings. Collectively, about half the gains go to households earning less than $40,000 per year. Households earning less than $100,000 income would see a net gain in income, while households with more than $100,000 would at best break even or more likely incur greater costs than any benefits received. Dave Wells holds a doctorate in Political Economy and Public Policy and is the Research Director for the Grand Canyon Institute, a centrist fiscal policy think tank founded in 2011. He can be reached at DWells@azgci.org or contact the Grand Canyon Institute at (602) 595-1025. See “History of the Minimum Wage,” BeBusinessed.com, http://bebusinessed.com/history/history-of-minimum-wage/ (accessed October 1, 2016). Data is from the Occupational Employment Statistics. For an overview last updated March 30, 2016 see http://www.bls.gov/oes/oes_emp.htm#overview. To find the Arizona data used in this section of the report go to http://www.bls.gov/oes/current/oes_az.htm. This data is from May 2015 and represents the most recent data available. Belman, Dale and Paul J. Wolfson (2014), What Does the Minimum Wage Do? Kalamazoo, MI: W.E. Upjohn Institute for Employment Research, http://dx.doi.org/10.17848/9780880994583. This 15 percent figure for indirectly impacted workers is the assumption used by University of California-Berkeley model used later. It’s very similar to the assumption used by the Congressional Budget Office model referenced later and the estimates from the Economic Policy Institute discussed later in the paper. Hammond, George (2016), “Arizona’s 30-year Outlook: Surfing a Wave of Growth,” Economic Business Research Center, University of Arizona, Sept. 22, https://www.azeconomy.org/2016/09/featured/arizonas-30-year-outlook-surfing-a-wave-of-growth/ (accessed October 6, 2016) and “Arizona Job Growth,” Department of Numbers, http://www.deptofnumbers.com/employment/arizona/ (accessed October 6, 2016). For a broad overview of 200 studies since 2000 on the minimum wage see also Belman, Dale and Paul J. Wolfson (2014), What Does the Minimum Wage Do? Kalamazoo, MI: W.E. Upjohn Institute for Employment Research, http://dx.doi.org/10.17848/9780880994583. A very accessible review of the literature with an emphasis on this new body of research can be found in Schmitt, John (2015), “Explaining the Small Employment Effects of the Minimum Wage in the United States,” Industrial Relations, Vol. 54, No. 4, October, pp. 547-581. Congressional Budget Office (2014), “The Effects of a Minimum Wage Increase on Employment and Family Income, Feb. 18, https://www.cbo.gov/publication/44995 (accessed September 30, 2016). U.S. Bureau of Labor Statistics (2015), “Highlights of women’s earnings in 2014,” BLS Reports, Report 1058, November, Table 9, p. 32, http://www.bls.gov/opub/reports/womens-earnings/archive/highlights-of-womens-earnings-in-2014.pdf (accessed October 1, 2016). The most recognized scholars in this view encapsulate the research with an emphasis from their perspective in David Neumark and William L. Wascher, Minimum Wages (MIT Press, 2008). For estimated job impacts see Reich, Michael, Sylvia Allegretto, Ken Jacobs, and Claire Montialoux (2016), “The Effects of a $15 Minimum Wage in New York State,” Center on Wage and Employment Dynamics, Institute for Research on Labor and Employment, University of California, Berkeley, March, http://www.irle.berkeley.edu/cwed/briefs/2016-01.pdf (accessed September 30, 2016). Their directly impacted number came from Cooper, David (2016), “Raising the New York State Minimum Wage to $15 by July 2021 would Lift wages for 3.2 million workers,” Economic Policy Institute, Briefing Paper #416, January 5, http://www.epi.org/publication/raising-new-york-state-minimum-wage-to-15/ )accessed September 30, 2016). Reich, Michael, Claire Montialoux, Sylvia Allegretto, Ken Jacobs, Annette Bernhardt and Sarah Thomason (2016), “The Effect of a $15 Minimum Wage by 2019 in San Jose and Santa Clara County,” Center on Wage and Employment Dynamics, Institute for Research on Labor and Employment, University of California,, June, http://irle.berkeley.edu/cwed/briefs/2016-03.pdf (accessed October 1, 2016). Lemos, Sara (2008), “A Survey of the Effects of the Minimum Wage on Prices,” Journal of Economic Surveys, Vol 22, No. 1, pp. 187-212.
 Cooper, David (2015), “Raising the Minimum Wage to $12 by 2020 Would Lift Wages for 35 Million American Workers,” Economic Policy Institute, Briefing Paper #405, July 14, http://www.epi.org/publication/raising-the-minimum-wage-to-12-by-2020-would-lift-wages-for-35-million-american-workers/ (accessed October 1, 2016). Bureau of the Census, “Fact Sheet: Differences Between the American Community Survey (ACS) and the Annual Social and Economic Supplement to the Current Population Survey (CPS ASEC),” last revised May 16, 2016, http://www.census.gov/topics/income-poverty/poverty/guidance/data-sources/acs-vs-cps.html (accessed October 2, 2016). The Current Population Survey, which is which generates our unemployment rates, is done monthly and captures more detailed work-related data. So for instance, hourly wages are imputes in the ACS work as respondents are asked for their annual income from working, average weeks worked per week and number of weeks worked per year. From these results hourly pay is estimated. Whereas, the CPS ASEC surveys fewer people but has that information more clearly specified. Consequently, there may be some slight discrepancies between this section and Table 2, as they are both surveys with slightly different estimates.